My friend Paul is expecting an article he wrote about wet fly fishing to be published in September's On The Water magazine. Paul is a frequent contributor to the magazine, and is known especially for his knowledge of small stream trout fishing. The magazine has two editions. One edition concentrates on New England fishing and the other on New York and New Jersey. Both appear to be more oriented toward salt-water fishing. For example, of seven articles in the August issue, six are salt-water oriented. This orientation doesn't surprise me, as the magazine's headquarters are in East Falmouth, MA, on Cape Cod. You can buy a copy or subscribe to the magazine by going to their Web site, http://www.onthewater.com/. Back issues are available and their Web site also includes a "where to buy" list. In preparing his materials for submission to the editor, Paul asked if I would photograph a selection of classic wet flies which he tied and delivered to me in the fly-box pictured below. 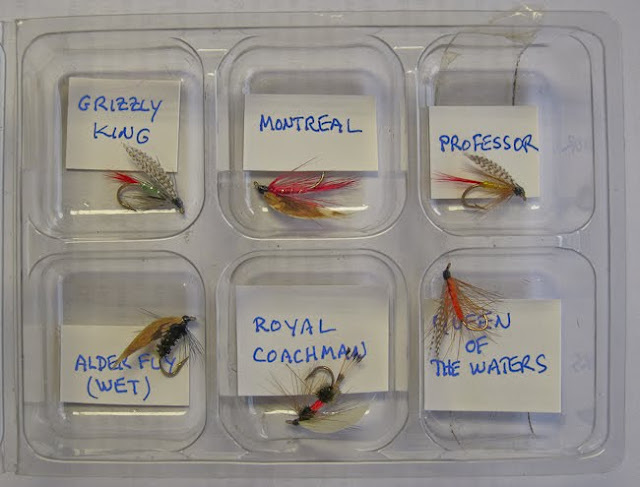 On my Web site's Flies with a Story page, I plan to post the individual images of each fly soon, along with some text and tying instructions from Paul. It's good to see that this selection includes one of my favorites, The Queen of the Waters! i've always loved the classic wets, classic Salmon flies, classic this and classic that.........but Jesus H., when is enough, ENOUGH already............another such article..................sorry, but i find it all soooo boring nowdays, when there is SO much more goin' on that is being totally neglected. TJA, I became intrigued with the fly when I also received a beautiful dryfly version from my friend Alberto. As I understand it from "Fishing Flies" by Terry Hellenkson, the original wet comes from James Watson of Scotland in 1830! I will be posting full size images soon. Anonymous, Ironically, though Paul writes one or two articles for On The Water every year, I know for a fact the doesn't read flyfishing magazines anymore (he's been at this for 40 some years!). Nor do I. So, neither one of us is aware that the subject has been overdone. Sorry. For what it's worth, for me it's really about the photograph. When I post them you are unlikely to notice, and most people will not care, but I shot 5 images of each fly, using 1mm differences in focal distances (like a cat scan) and combined them in photoshop. All to increase the depth of field on each fly. On a computer monitor the difference isn't too significant, but in print form... WOW.